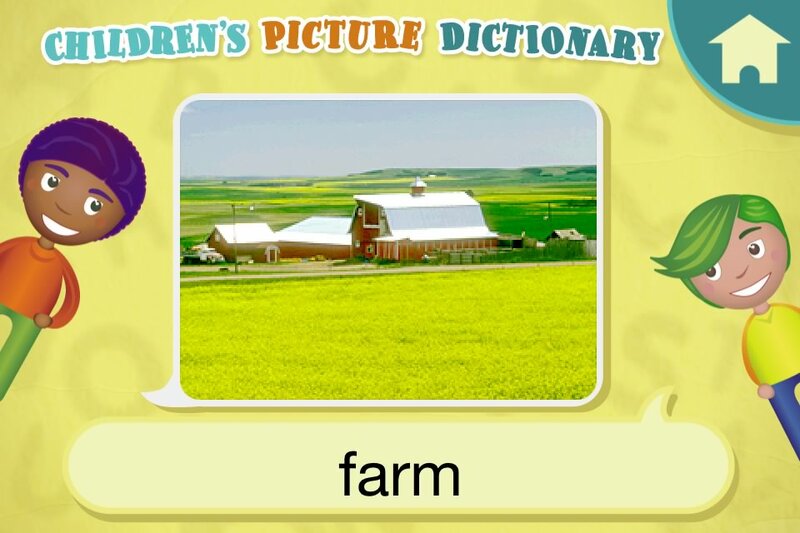 Selectsoft, a California-based developer of family-friendly games, has released Children's Picture Dictionary, a fun-filled talking picture dictionary and educational game designed for iPad(R) and iPhone(R). Children can expand their vocabulary by browsing through over 1,700 words accompanied by colorful pictures and spoken sentences. Or kids can play a fun matching game for another way to discover new words. This universal app is available now for the iPad(R) and iPhone(R) on the App Store. A fun-filled talking picture dictionary and game! It's a simple and entertaining way to discover new words that's perfect for the earliest learners. Selectsoft, a leading developer of family-friendly games, has released Children's Picture Dictionary, a fun-filled talking picture dictionary and educational game designed especially for iPad® and iPhone®. Children can expand their vocabulary by browsing through over 1,700 words accompanied by colorful pictures. Kids tap the word to hear it spoken aloud, then tap the picture to hear it used in a sentence. Switching to Game Mode, users can play a word matching game for another fun way to discover new vocabulary. Though a simple concept, the talking dictionary approach is a way to encourage early development of language, reading and listening skills for young children. This universal app is available now for the iPad® and iPhone® on the App Store. Children's Picture Dictionary features bright art and colorful cartoon characters to create an inviting, child-friendly interface. 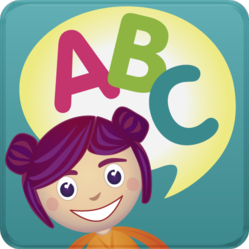 A large alphabet menu lets users choose their favorite letter to explore, or kids can use the simple search function to jump to a specific entry. Even the youngest children can easily swipe from word to word as they browse through the dictionary. Spoken audio provides the pronunciation for each word, while an example sentence and picture illustrate the meaning. It's a simple and entertaining way to discover new words that's perfect for the earliest learners. In addition to the word entries, Children's Picture Dictionary also includes a Game Mode that lets users play a fun word matching game. 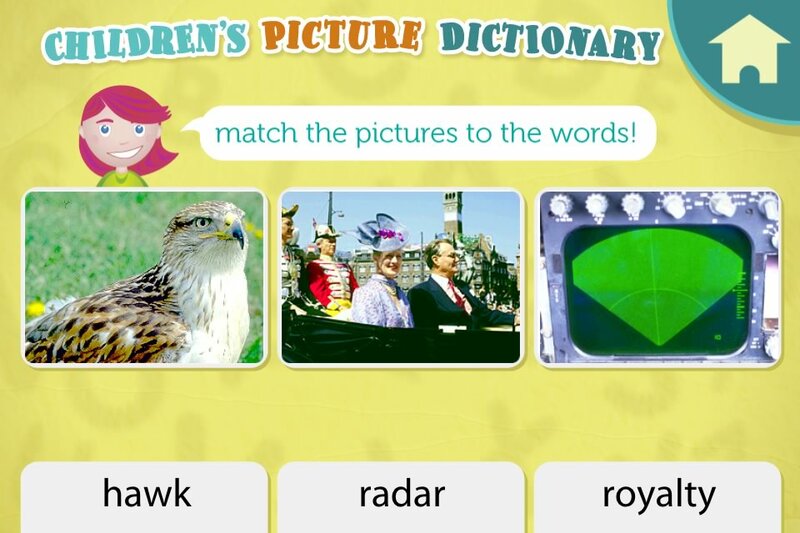 Kids match each picture to the right word using what they've learned from the dictionary. Funny sound effects and friendly popups let the child know if they've guessed correctly or need to try again. With no time limit or scores, it's a relaxing and stress-free way for children to practice and explore their new vocabulary. Children's Picture Dictionary is the latest in Selectsoft's growing line of educational apps which combine learning with fun games and which includes Super Word Search!, the Play & Learn foreign language series and the upcoming Addition Frenzy. 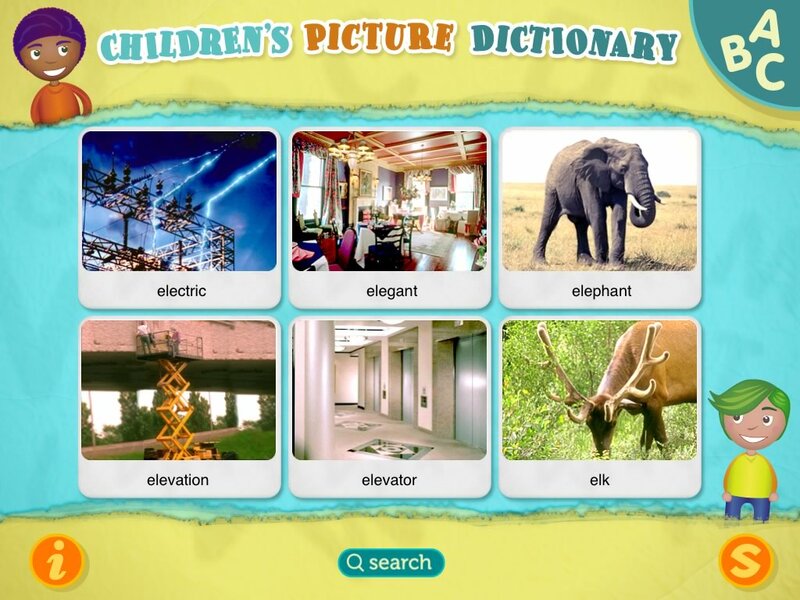 As a family-oriented developer with a background in both casual games and educational programs, Children's Picture Dictionary is part of Selectsoft's continuing commitment to creating entertaining educational apps for all ages. If a picture is worth a thousand words, there's no better way for kids to build their vocabulary than with Children's Picture Dictionary! Tap the word to hear it spoken aloud, then tap the picture to hear it used in a sentence. Switch to Game mode and practice what you've learned with a fun matching puzzle. It's a fantastic way for young children to discover new words. Swipe through over 1,700 words, each accompanied by colorful pictures, or use the fast search function to go to specific entries. The simple controls and easy navigation make it fun for kids of all ages to use. Browse through the alphabet, or use the easy search function—it makes finding words a snap! Children's Picture Dictionary 1.0 is available at the special introductory price of $1.99 USD (or equivalent amount in other currencies) and can be found worldwide through the App Store in the Education category. Headquartered in San Mateo, California, Selectsoft is a leading developer of family-friendly games and apps, creating best-selling games for iOS, Nintendo DSi(TM) and Wii(TM), Android, Mac and PC. It's also one of the largest independent publishers of PC and Mac software, featuring licensed content from Broderbund, Disney, The Learning Company, Big Fish Games and many more. For almost 20 years, Selectsoft has been dedicated to providing affordable, fun entertainment for the whole family. Copyright (C) 1992-2012 Selectsoft. All Rights Reserved. Apple, the Apple logo, iPhone, iPod and iPad are registered trademarks of Apple Inc. in the U.S. and/or other countries. Amazon is a trademark of Amazon.com, Inc. or its affiliates. Android is a trademark of Google Inc. Other trademarks and registered trademarks may be the property of their respective owners. Over 1,700 words to choose from.Children's Picture Dictionary iPad® screenshot Match the words to the pictures with a fun puzzle game.Children's Picture Dictionary iPhone® screenshot. Includes colorful photos for every word.Children's Picture Dictionary iPhone® screenshot.